There are numerous models in the DTX series, but Yamaha has invested in a lot of resources to make this the best of those electronic kits – in their opinion. And truly, the Yamaha DTX562K comes with a revamped module and has some interesting new features packed into that. On the other hand, this set will cost you significantly more than other kits in the DTX series, so it makes sense to check whether the Yamaha DTX562K fulfills your needs or not. I’ll do my best to help you decide in the basis of this Yamaha DTX562K review. Great price for the quality of the product. Top of the line sound quality. The design is very sturdy and easy to maneuver. It does not include a kick pedal. The headphone jack could be in a better location. Your Comment, Question or Opinion to Share? If you purchased this drum kit online, you will receive a 77 x 41 x 27 inch box that weighs about 50 pounds. The package also comes with a very stable rack and a DTX502 module that far outshines the older models. The drum kit does not include a foot pedal for the kick pad. You will need to purchase that separately and you can find out about good budget bass drum pedals here. This Yamaha drum kit includes state of the art features that create an expressive harmony of musical notes. Yamaha used laser technology to analyze thousands of drum strokes in order to create realistic trigger settings that are required for a precision instrument. The powerful new DTX502 Drum Trigger module comes programmed with 690 instruments. That is an astounding 250 sounds more than its predecessor. 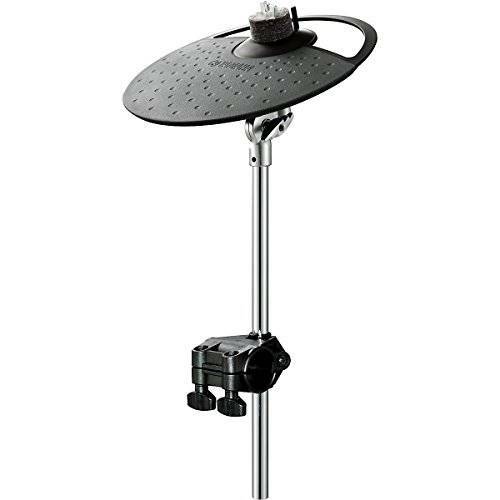 This particular model includes a cymbal with a choke function which gives you the ability to add texture to your music. This kit allows you to upgrade several pads and cymbals to design a perfect drum set. 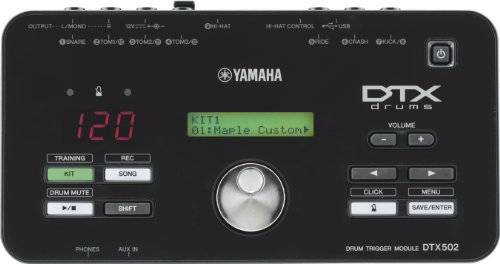 The DTX502 Drum Trigger module is far superior than the older Yamaha modules in the DTX series. This module comes programmed with hundreds of crisp sounds that greatly improve the playability and versatility of the instrument. The technology is user friendly and readily presents a clear sound even before the editing process. The sound quality is truly second to none. This superb quality can be attributed to Yamaha incorporating authentic acoustic drum sounds in the programming. These authentic sounds are what separates the lesser quality products with top of the line instruments. The best feature of this module is that it has a training function that even the most experienced musicians can benefit from. The function will analyze your rhythm, pad accuracy, and endurance throughout a song. The system then presents a score based on that analysis, and your goal is to improve and beat your own high score. That’s pretty good motivation, don’t you think? I’m fickle when I play, so I like to have the option to upgrade my pads and rotate them as I see fit. I love that this model is compatible with several additional pads (that can be purchased separately). Plus, they can easily be bought online. Yamaha also sells single and dual zone triangular cymbals that give a much softer sound than the stock three zone pads. There is also the option to add a kick pad that is capable of fitting double kick pedals. The versatility of this drum kit looks amazing to play and it is so easy to get the extra accessories to make your own unique configuration and create the perfect harmony. There are many upsides to this drum set, but some of the most notable include: price, sound quality, product design, and advanced technology. This product is a great deal compared to models in a similar price range. Most products that deliver this level of sound quality are usually in a much higher price range. This is definitely a user-friendly product that will sell quickly. The playability of this drum kit is smooth because of the high quality design of the instrument. The rack is made with strong materials that give it a very sturdy base. If you are investing several hundred dollars on an instrument you want to make sure it won’t be easily knocked over. It does not come with a kick pedal. I would be very frustrated as a customer if I purchased an expensive product and it didn’t come with what I expected. That being said, good pedals can be had on a budget and in the age of same-day delivery, you would be playing the instrument in no time. The headphone jack is very close to the Hi-Hat which can get in the way while playing. I’ve since learned to adjust the cord, but it definitely got in the way while I was playing. Q: Is the kick pedal included in the set? Q: Can I add an extra cymbal to use as a China? A: Yes, the back of the kick tower will have an additional slot to insert the cymbal. Q: Is the kick pad large enough to support a double pedal? A: No, but you can purchase an additional kick pad that is large enough for a double pedal. 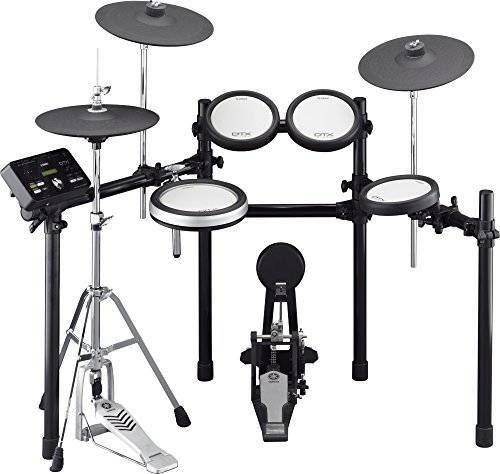 The Roland TD-11KV electronic drum kit is very similar to the Yamaha DTX562K in both price and playability. The Roland is a few hundred dollars cheaper and about 20 pounds heavier than the Yamaha. The largest difference between the two kits is that the Roland uses a module that doesn’t come with nearly as many pre-programmed sounds to use in your drumming. The two play very similarly, so the debate seems to come down to the range of sounds you want to make use of. Another alternative, and a significant step up from the Yamaha DTX562K would be the Roland TD-25KV which you can check out in detail here. After hours of extensive research, I have come to the conclusion that this is an extremely well made product with user-friendly playability features. I’m totally impressed with the improvements of the module and the dedication Yamaha took to ensure seamless sound transition. The strokes I place on the pad flawlessly turn into wonderful notes in my headphones. 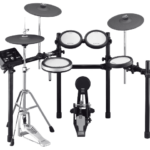 If I were looking to buy an electronic drum kit, the Yamaha DTX562K would definitely be my first choice. If you have any comments, questions, or concerns with this product pleaselet me know in the comment section. If you have personally used this product, I’d love to hear what you think! considering purchasing this kit. my only reservation is the kick pedal – does the sound carry? I’m in a second floor apartment and i have a thick carpet in the room but still worried the sound of the kick will go through to my neighbours. Fully professional: check out this tutorial. The idea is to combine wood and tennis balls to soak up the vibrations. Step-by-step solution: Use a carpet underneath your drums. It will soak some of the vibrations. If that doesn’t work, Use wood underneath that carpet, which will soak up even more vibrations. If that doesn’t work, try the riser. Do you think the upgrade would be worth while? Thanks for your question – which also reminds me that I should finally put together a review of the Roland TD-25K. The DTX562K comes with 2 triple-zone cymbals whereas the TD-25K has one dual and one triple zone cymbal pads. The TD-25K comes with 3 dual-zone tom pads while the DTX562K’s tom pads are all single zone. So in terms of pads, it’s sort of even – and it depends if sound variability is more important to you when it comes to toms or cymbals. Then there is the module, and here the TD-25K is the more professional and flexible version as it has allows you to completely mix the sounds yourself. The DTX562K comes with 690 well-sounding instruments on board but you can’t bend them yourself as much. On the other hand, more customization obviously also means that you’ll have to look into how the module works and familiarize yourself with it.